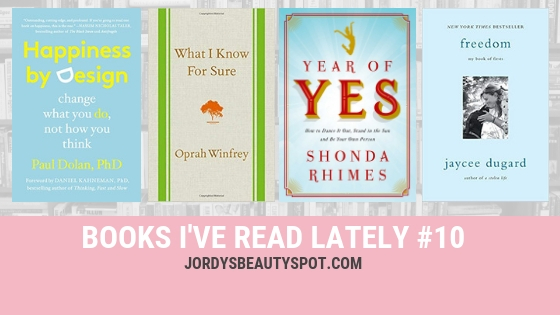 I wanted to open this post with the above quote from an Oprah book we will discuss later because it speaks volumes (pun intended) of the importance of reading and why I am so passionate about it. So we're at the start of the second quarter of the year, and that means we're already 1/4 of the way through 2019! So I thought it would be timely to wrap up all the books I've read lately! The goal larger goal is to read 40 this year, but in an even broader sense, I suppose the goal is to feed my mind with new ideas and to open myself to new ways of thinking as the above quote from Oprah explains. So I'm going to be recapping the books that I have read lately, as briefly as I can while still giving them justice because there are some fantastic books to go through here. The basis of this book is to explain how a large part of how you feel is determined by what you do, what you do is largely motivated by the expected impact on your happiness and happiness is the feedback you receive is fuabout the impact of what you do. It explains that changing behaviour and embracing happiness is as much about withdrawing attention from the negative as it is about attending to the positive. a. Your happiness is determined by how you allocate your attention. What you attend to drives your behaviour and it determines your happiness. Attention is the glue that holds your life together. Happiness is experiences of purpose and pleasure over time. c. Events in life are attention-grabbing to begin with. You then react and if you can explain the event, you will withdraw your attention and adapt to it. Much of this process will occur automatically without conscious effort. Sometimes you will keep reacting if you are lacking that all-important explanation. d. What you feel is determined by what happens to you but also by the kind of person you are. I am much more interested in the meaning of moments than I am in constructions of the meaning of life. e. The same life events and circumstances can affect your life a lot or a little depending how much attention you pay to them. Two people who are in every way identical can be very differently happy depending on how they convert inputs into the output of happiness. f. You need to be pretty confident that any current sacrifices of happiness you make in order to fulfil some ambition or other will actually be worth it in the long run. We all know Oprah is a wise source and driving force within the self-improvement industry! So her book combines years of gained knowledge through experience and puts into words bite-sized life lessons to ponder on. I will let the book do the talking with the below excerpts. a. Changing the way you think about your situation is the key to changing it. All of our hurdles have meaning and being open to learning from those challenges is the difference between succeeding and getting stuck. c. Nothing can bring you peace, but yourself. d. Being grateful all the time isn’t easy. But it’s when you feel least thankful that you are most in need of what gratitude can give you: perspective. Gratitude can transform any situation. It alters your vibration, moving you from negative energy to positive. It’s the quickest, easiest, most powerful way to effect change in your life—this I know for sure. This kickass book is full of EMPOWERMENT to believe in yourself and self-love strategies. Again, the excerpts from the book I have selected are going to give you a much better vibe of the book and its themes than I can explain. a. Badassery: 1. (noun) the practice of knowing one’s own accomplishments and gifts, accepting one’s own accomplishments and gifts and celebrating one’s own accomplishments and gifts; 2. (noun) the practice of living life with swagger : SWAGGER (noun or verb) a state of being that involves loving oneself, waking up “like this” and not giving a crap what anyone else thinks about you. Term first coined by William Shakespeare. b. You know what happens when all of your dreams come true? Nothing. I realized a very simple truth: that success, fame, having all my dreams come true would not fix or improve me, it wasn’t an instant potion for personal growth. d. Because no matter how hard a conversation is, I know that on the other side of that difficult conversation lies peace. Knowledge. An answer delivered. Character is revealed. Truces are formed. Misunderstandings are resolved. Freedom lies across the field of the difficult conversation. And the more difficult the conversation, the greater the freedom. If you don't know much about the backstory of Jaycee Dugard, then you should really look into the difficulties this woman has been through. Held captive for over a decade, imprisoned in a backyard by her abuser. Honestly the whole story is horrific and has caught my attention for years, which is why when I saw her book I knew I had to give it a read. She talks through experiencing all her firsts after being rescued from her horrible situation. Her first plane ride, first dog etc. It is a sweet and motivating book that shows thriving in the face of diversity and not being a victim to circumstances. All in all, it speaks of healing and recovery from past traumas and is a fantastic read.